Never Enough Nails: Lynnderella Friday, Vol. 43!! Hi everyone, hope you had a great week and are ready for a nice weekend! I know I am! 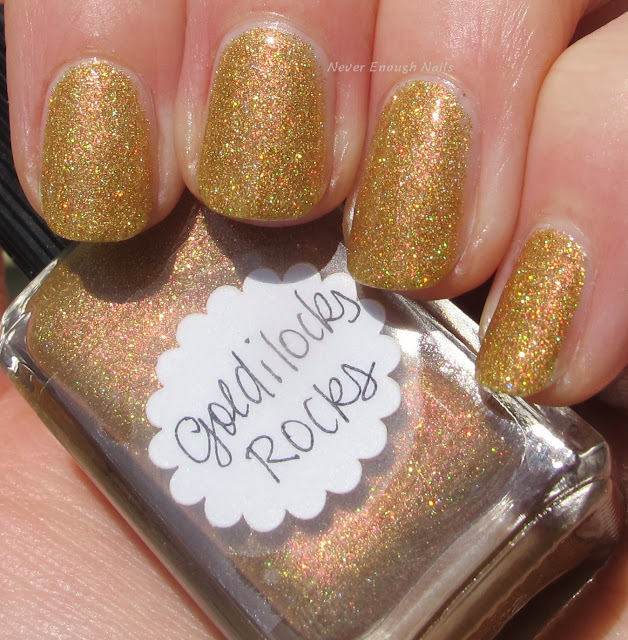 Let's kick Friday off with some sparkly treats, like Lynnderella A Deeper CommitMint. A Deeper CommitMint is an aqua mint shimmer with iridescent blue sparks and holo aqua microglitter. This is so gorgeous, just the perfect shade of mint. The sparkle is beautiful too! This is two coats. It was nicely opaque and pretty easy to apply. It looks a little textured in the photo below, but with one layer of top coat, it was smooth to the touch. 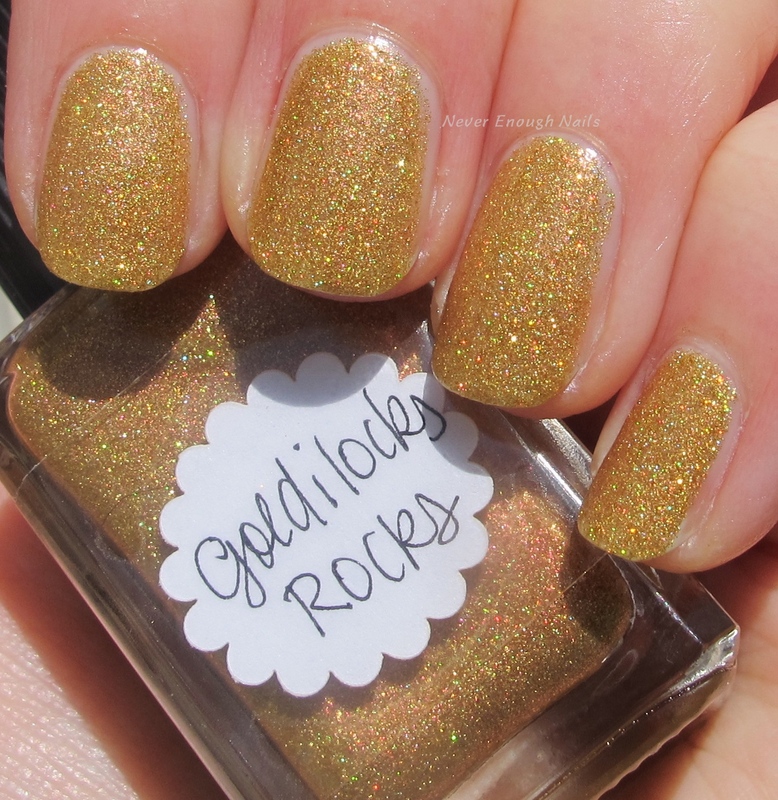 Lynnderella Goldilocks Rocks is a warm burnished gold holo nanoglitter with tons of pinky peach shimmer. In person, the effect of the peach shimmer with the gold is almost like a duochrome (you can kind of see that in the bottom part of the bottle in the picture above). It's SO cool! Very unique and different in my vast collection of gold glitters. Two easy coats again and smooth with one layer of top coat! I am starting to reswatch some older Lynnderellas that are still available for sale. Some of my very old swatches are not good and I would like to do justice to these lovelies. So I am including a few today and there will be more next week! 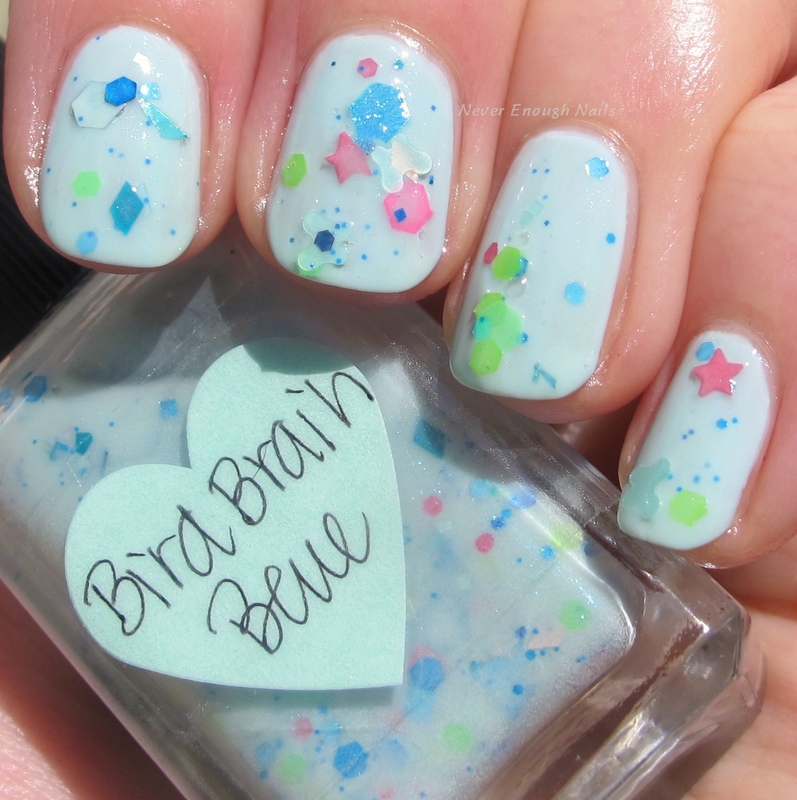 Lynnderella Bird Brain Blue has a great milky blue translucent base with shiny and satin glitters in shades of blue, pink and green. 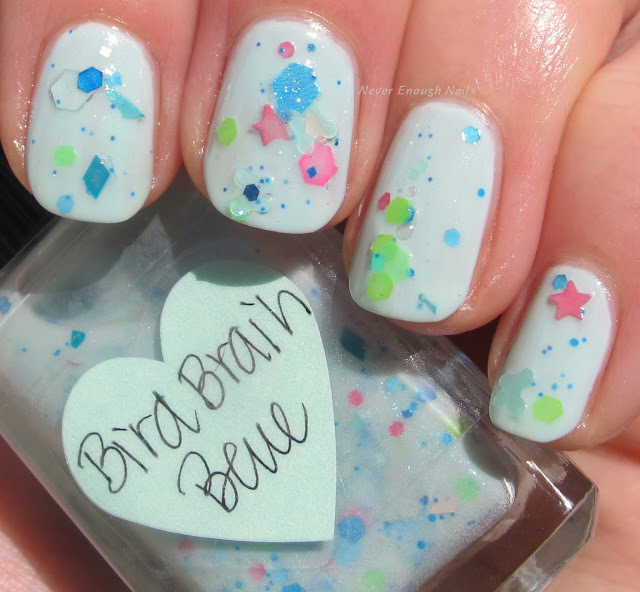 This is one coat of Bird Brain Blue over OPI It's a Boy. The glitter pieces are larger, so I find it easiest to use the dabbing method to apply this one. 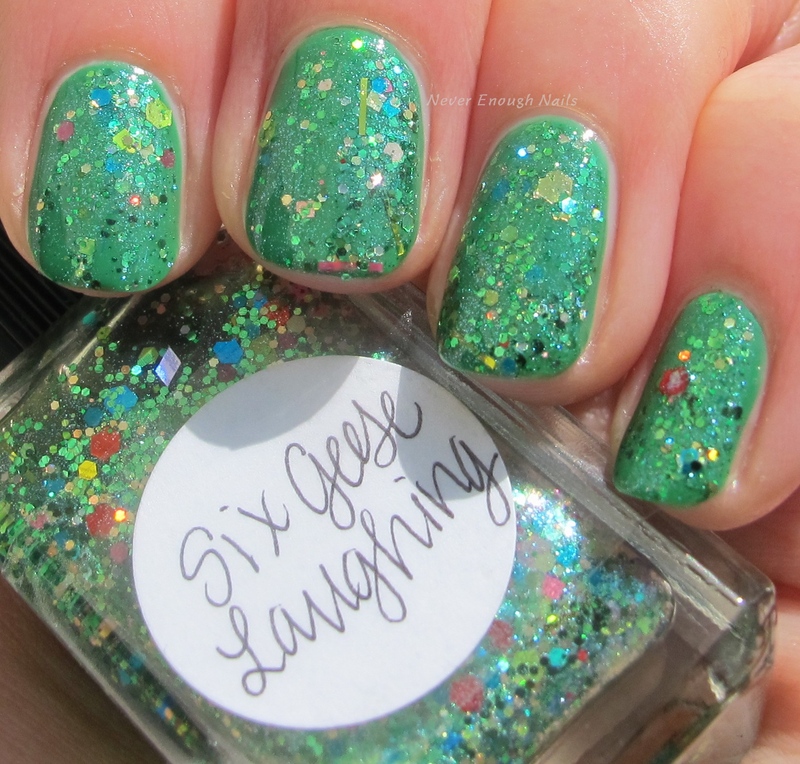 Lynnderella Six Geese Laughing is still a favorite of mine! This is such a gorgeous green glitter mix. The green is accented with red, gold and some blue glitters. 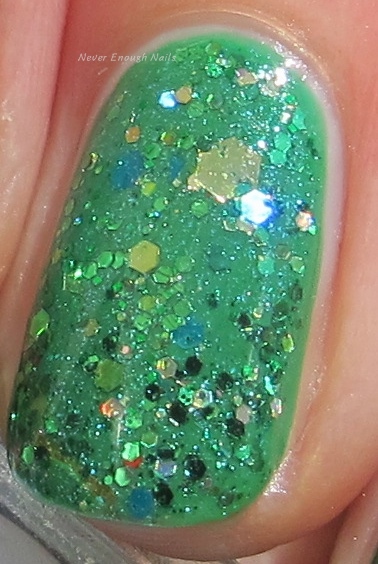 I really love all the little green hex glitters surrounded by the larger accents. This is one coat over Revlon Posh. Very easy to apply! Lynnderella Mr. 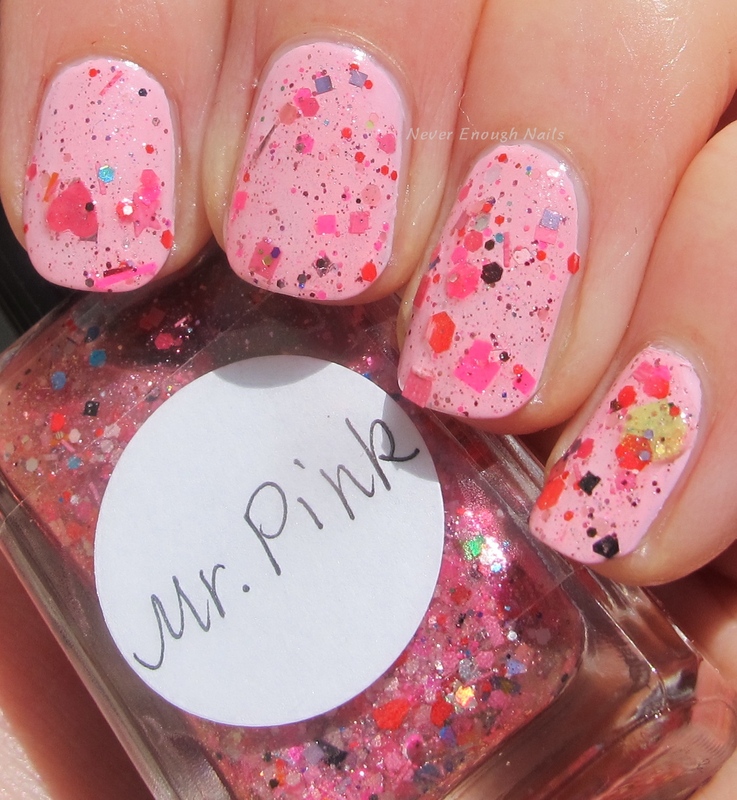 Pink has all sorts of pink glitters in a clear, pink-shimmered base. It also contains red, blue and some other assorted colors to make the pink really pop. This makes me remember that my first Lynnderella loves are her glitter toppers. I love her microglitters of course, but the toppers really steal my heart. She has a knack for combining some shapes and colors of glitters that I love! This is one coat over OPI Mod About You. I applied this with the dabbing method too, as it has some large shapes. All of these glittery goodies are available on lynnderella.com right now!